Following up a previous portion of a softball interview comes BISNOWTV EXCLUSIVE: FOREST CITY RATNER CEO MARYANNE GILMARTIN ON WORKING WITH FOREIGN INVESTORS, BECOMING A REIT. So again I'll interpolate comments (in italics) in the discussion between Kenneth Weissenberg, partner at EisnerAmper, and MaryAnne Gilmartin, president & CEO at Forest City Ratner. KW: That's terrific. (Staying chummy) Recently, financing has become tougher.. you've gone REIT, the parent company has gone REIT. Is that in part to help with the financing situation? MAG: Another great question. (Ditto) We were a public non-REIT company for many many years. For lots of reasons, it became clear that we needed to become a REIT. We needed to be judged along a REIT peer set and we needed to basically change in many ways the approach we had to development by not using as much leverage. When the last downturn occurred, we were highly levered. We had a lot of development on our books, and we didn't have enough liquidity. So as we've come out of the recession, we've changed our model, which is now a model of collaborating and partnering with other equity investors because we know how to develop, and that's a high barriers-to-entry profession. (But aren't they sacrificing some things too?) But we also think people like to invest with developers who really know how to develop in a city like New York. So we've been able to bring in partners, which has helped, because now we're getting much less financing in each of our buildings. In the old days, we would would finance up to 70, 75% of a project's total cost, today we're calibrating closer to 50% or 60%. That's just a new way of doing business as a REIT, and a smarter way to do business if your balance sheet is healthy, because you can borrow money cheaper. So, we've been all about less leverage. So was the world has changed, and leverage has become more challenging, in many ways, it lines up nicely with our strategy generally. KW: The cost of capital becomes something that makes REITs a very attractive alternative. KW: You're developing here. What's next on the horizon? MAG: So I love our city. I like to say, follow the artist and restaurants. Brooklyn is an amazing place, and we're continuing to focus on Brooklyn, because it's the place to be. (Because they have approved development sites in the Pacific Park project.) Because of that, we're ready to put together an iconic headquarters office building, brand new, which really hasn't happened in many years in New York. There are folks like Jared Kushner that are buying existing buildings (aka "DUMBO Heights") and putting together space for technology companies. MAG: That's what we're doing in Brooklyn. I'm an office developer, first and foremost... I would say we are going to keep trying to put a building online within the next few years, because the entitlements are under way (but not yet close to approved, given the need for Empire State Development approval, which will come only after the P.C. Richard eminent domain case is resolved), and you find an anchor tenant (not so easy) and you construct the project. MAG: Elsewhere, we're looking at places like Queens, and South Bronx, even New Jersey. The opportunities exist there, because the land prices are still manageable enough where you don't need to build condos to come out. I call condominium development the great allocator of land costs. So my concern about rising land costs in Manhattan and Brooklyn is that, when a developer buys land for the pricing you see today, it forces the developer to look at certain product types in order to deliver the returns. And the most obvious product type is condominium. And it would be awfully sad if everything built in the next few years were condominium, both in Brooklyn and Manhattan. KW: Some of the prices they're asking for condominiums you have to be a billionaire to afford. MAG: That's an interesting statement, (segue to sales pitch!) because what $1500 a foot gets you in Brooklyn, compared to $1500 a foot in Manhattan, is an extraordinary difference. 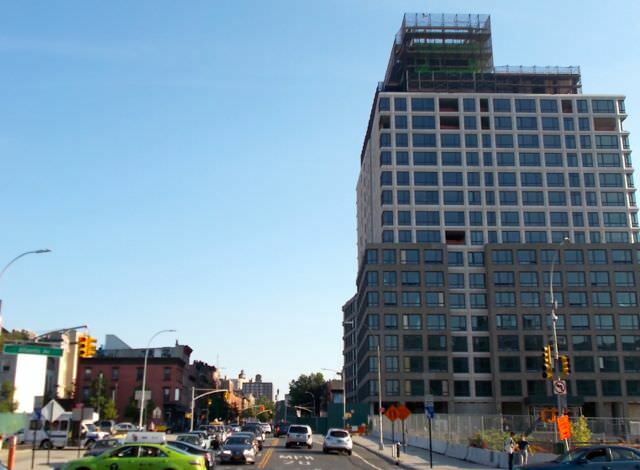 The luxury definition in Brooklyn is not high-rise glass and steel towers, it's contextual (!?! ), it's beautiful, it's more organic and it's knowing your barista down in the lobby of the building, the person that makes your coffee. ("Know your barista" was not the selling point of the Atlantic Yards Community Benefits Agreement.) We're creating a new kind of luxury in Brooklyn, with our condominium project, 550 Vanderbilt, we're about 50% sold (and were 30% sold upon official sales launch nine months ago) and the pricing is really sold, and y'know, in slow and steady fashion, we think the Brooklyn market will continue to outperform the other boroughs. KW: You mentioned the South Bronx or Queens... Do you see the Bronx as potentially the next Brooklyn? MAG: I think Queens first... The competitor with Queens today is Jersey City, in my view. I think those will basically be driven forward at the same general pace... Some people will prefer the gold cost of New Jersey, others will prefer Queens. I was born in Queens, I prefer Queens... You know the advantages of Queens. The views of the midtown skyline from Queens are exceptional. (By Queens she means Long Island City, and maybe Astoria, surely not the rest of the sprawling borough.) The ferry service we're putting here in Roosevelt Island is going to make access from Roosevelt Island to Long Island City to the Navy Yard to the East Side of Manhattan extraordinarily easy. So I think Queens is going to move forward in a very, very positive way, but the land pricing will probably edge up. And that'll force developers to look in other places. I think the Bronx scores very high.... It is well served by mass transit, it's proximate to all the activity in the urban core... and it's a great place; the food and the culture is now at an inflection point (which means there are new coffee shops? ), which I think is the beginning of its moment. Trump "Creative With the Truth"? Ratner too.